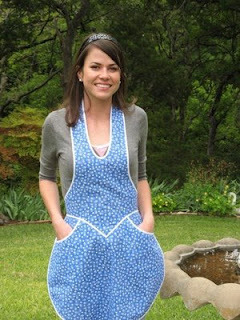 The only apron I have ever owned was a gift from my sister. She sent me a cute denim one with her kids' painted hand prints all over it. I regret to inform her it has been lost in the shuffle of all the moving we have done over the years. I know it's here somewhere, just have no idea what shelf or storage bin it was tucked into. So....I waited too long to purchase and send a photo of my apron. I did find the one I should have ordered. But let's be honest here, in my home, take-out is becoming the dinner wave of the future with my appetite and energy diminishing. 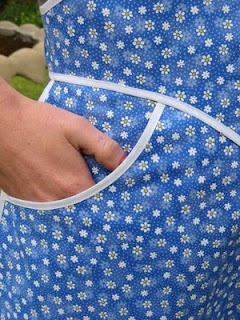 In another state of mind I may order this darling apron from Etsy. I mostly love it cos I could wear it with nothing under it on a night the kiddies are nestled in their beds so I can properly greet The Mister after a long day of work. THAT, my friends, is an important part of apron shopping.